With today’s Halloween holiday, people are turning to the web to look for last-minute costumes and pumpkin-carving tips. Top costume searches include Elsa from Frozen, Anna from Frozen, Olaf from Frozen (people can’t just let it go, can they?) and Maleficent. Whether you’re trick-or-treating or not, get the most out of the twilight hours tonight—Daylight Saving Time comes to an end on Sunday, which means it will be getting darker earlier. At least you get some extra sleep out of the deal. The World Series came to a thrilling conclusion on Wednesday night with Game 7 in Kansas City’s Kauffman Stadium, as the San Francisco Giants took home their third victory in just five (even) years. The star of the night—and the series—was undoubtedly Madison Bumgarner, the Giants’ 25-year-old ace starting pitcher who came into the game in relief in the fifth inning and more than earned both the save and his MVP trophy, capping off a postseason performance for the history books. 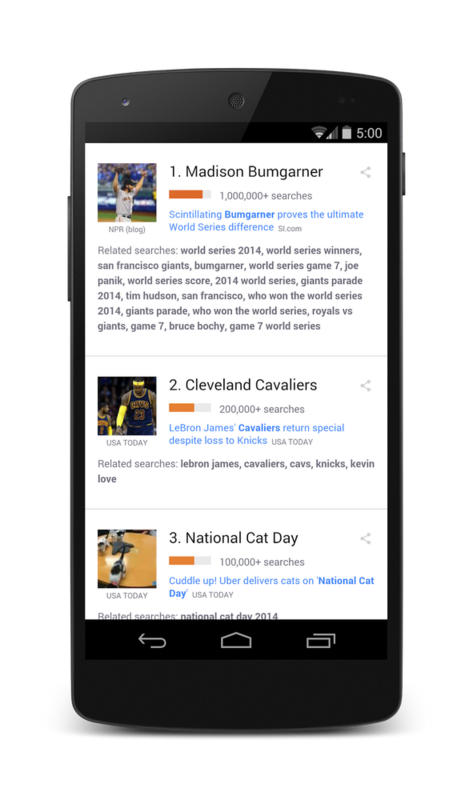 He was the top topic in search Wednesday, with more than 1 million searches. Fellow teammates Buster Posey and “Panda” Pablo Sandoval were also on the list. As baseball fans put their caps and gloves in storage and look longingly at the calendar for March (pitchers and catchers report in 114 days! ), fans of the NBA are just getting going. Basketball season started this week and the web was full of searches for the Cleveland Cavaliers (who are welcoming hometown hero Lebron James back to the fold), Miami Heat (the team LeBron left behind) and Chicago Bulls. There was a spike in searches around NASA when an unmanned rocket erupted into flames seconds after liftoff on Tuesday. The spacecraft and its cargo were lost, and the launch pad suffered heavy damage. Also this week, there was a breakthrough in the mystery of Amelia Earhart’s final flight. A piece of debris located on a tiny island has been identified as a piece of her lost plane. Marvel this week revealed a lineup of nine new movies to be released over the coming years, along with some casting details. Alongside familiar faces like Captain America and Iron Man, we’ll soon see a film about the Black Panther, who will be played by Chadwick Boseman. Marvel also revealed that Sherlock star (and Internet fave)Benedict Cumberbatch will play Doctor Strange in the 2016 movie. Don’t get caught off-guard by the changing of the clocks. With the Google app, you can set a reminder to reset the clocks on your microwave, in your car and on your wall as soon as Daylight Saving Time comes to an end on Sunday. Just open the app and say “Ok Google, remind me to change the clocks on Sunday.” Now relax and enjoy that extra hour of sleep!